We have finally come to the end of the February weekly giveaway! I would like to start off by announcing the winner of this past week’s giveaway. Congratulations to Diamond E.! Didn’t win last week? Don’t get discouraged! It is our LAST giveaway! Same as last week, under this post, you must describe what makes YOU a Contemporary African Woman. Your response must be at least 2 sentences long. Your response may include personal accomplishments, struggles, career, or anything you feel qualifies you as a woman living in modern times. The last day to enter is Feb. 27, 2017 by 11:59pm EST. Once you have entered your response, there will be a random drawing and the lucky winner will be announced Feb. 28th! Below are the pictures of this week’s giveaway item. Special thanks to Angela for modeling this top for me! 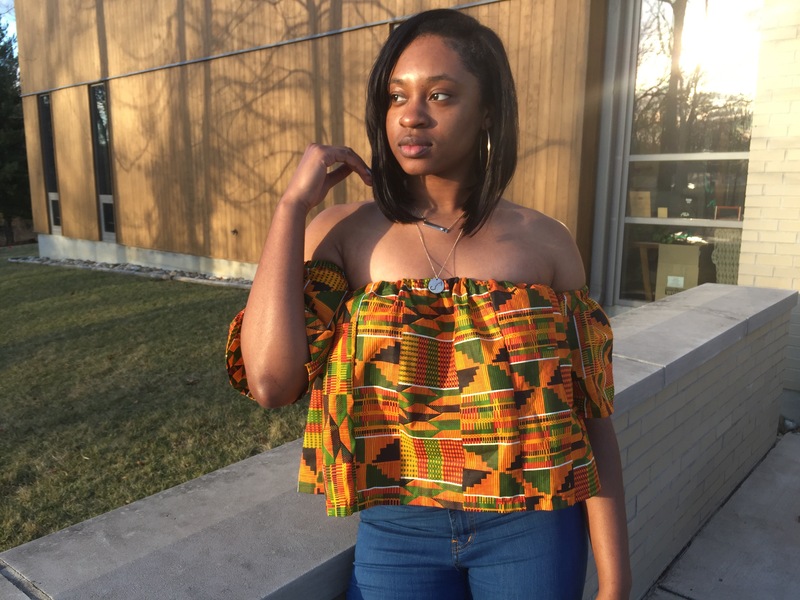 This off-the-shoulder Ankara inspired top is made from 100% authentic HiTarget African fabric. It is a perfect blend of chic and casual and fits perfectly with almost any bottoms. What about the men then? How come we can’t win too? Being able to set goals and have aspirations that have yet to be reached in my family makes me a Contemporary African Woman. I am able to achieve what has yet to be done and close the gap between dreams and reality. What makes me a Contemporary Woman is that I know what it took to get me where I am so I work harder to get where I need to be. “No” is motivation to me. Negative statements push me forward. If someone says no I will work harder to prove them wrong because nothing will get in the way of all I have worked for. I live everyday pushing through, trying to get better in any circumstance with my family by my side. Previous failure will not bring me down. Living in this world has taught me to always finish what I started because opportunity only knocks once. Few women have played a publicized significant role in African development and I plan to be one. This desire was the impetus in my pursuit of a master’s in public administration, after which I lived and worked in naija for 14months serving widows and sexually abused youth with our team at Blessing O. Foundation Int’l. What makes me a Contemporary Woman is the fact that i strive for the best! Regardless of where i am in life, i know i can do bettter for myself. Growing up, making a B in a class was considered failure or an “okay” grade. Using this as a motivation everyday, I always strive for better things than i had yesterday and the days before. What makes me a contemporary African woman is How I represent my culture in my day-to-day life, how bold, courageous, and intelligent I am. Being an African woman makes me never to give up on negative comments or bullies rather it inspires me to keep pushing in other to excel in life. Being African woman is all about hard work and love, that’s why I enjoy being the pride of Africa. I do not compare in other to compete, but rather to motivate myself. I love my top. It looks beautiful on my smooth deep chocolate skin.